It's happened to the best of us. You have a job opening to fill. You interview a range of qualified candidates and hire the best of the bunch-or so you think. You soon realize that the person who seemed like a perfect fit during the interview doesn't have what it takes to do the job. 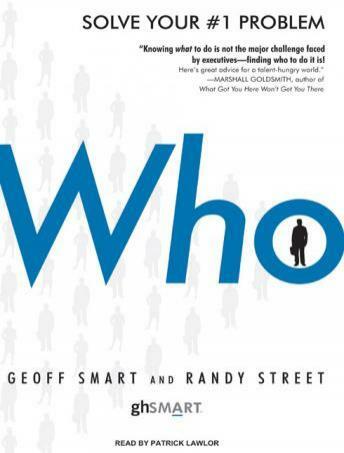 In Who, Geoff Smart and Randy Street, of the management consulting firm ghSmart, combine their experiences training thousands of managers and executives with the most revealing and comprehensive research ever on the subject of how to hire successfully, as well as advice and stories from more than twenty billionaires and sixty CEOs. The result is a simple, four-step method for hiring with confidence, designed for everyone from the CEO on down. Who shows you how to avoid the most common pitfalls of hiring, how to identify 'A Players'-people who can perform their job better than 90 percent of the candidates in their field-and how to make sure the best candidate will be excited to join your organization.